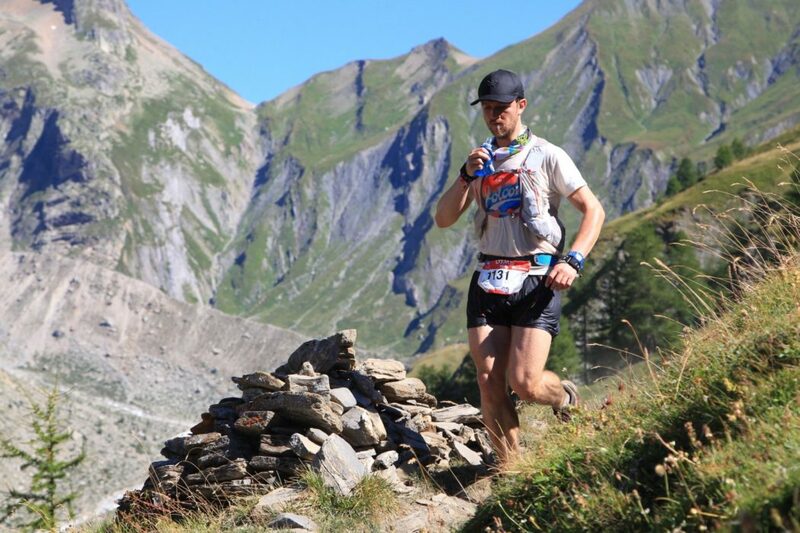 Cicerone's Joe Williams recently competed the Ultra Trail du Mont Blanc - A 170km (105 miles) mountain race with 10,000m of ascent around Month Blanc. Here he tells his personal story of this epic event. 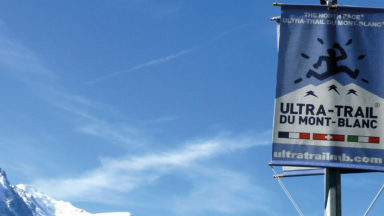 The Ultra Trail du Mont Blanc (UTMB) is one of the most famous mountain ultra trail races in the world. 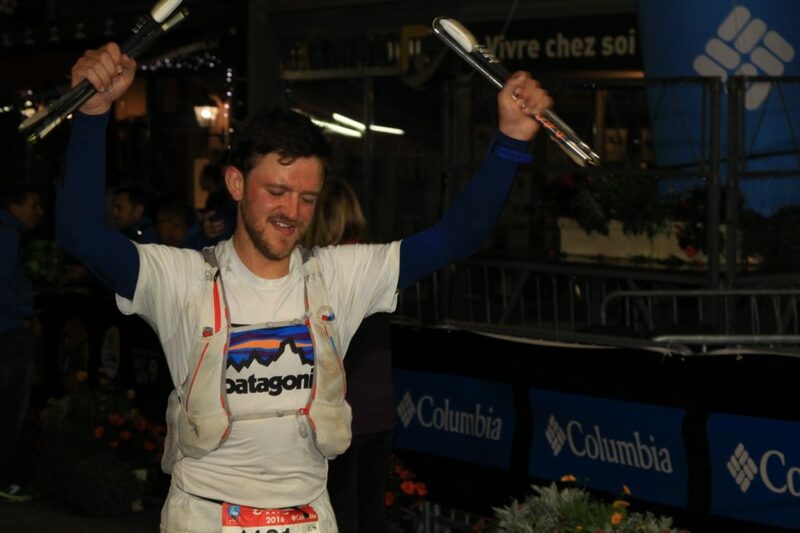 It traverses three countries (France, Italy and Switzerland), covers 170km (105 miles) and ascends 10,000m, starting and finishing in the global capital of mountains, Chamonix. 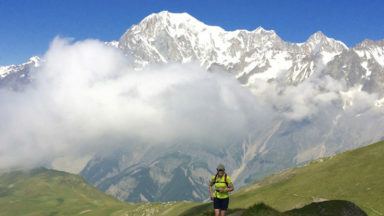 Each year, up to 2500 lucky ultramarathon runners get the chance to line up for this adventure that roughly follows the famous Tour of Mont Blanc trekking route. Runners have 46.5 hours to complete the journey - many will fail to finish, typically succumbing to exhaustion, injury or gastrointestinal distress. An aura was approaching from behind. I could hear it gasping. Its light-source was slowly closing in on me, despite my efforts to fight it off. Still I walked on, pathetically slow and confused, up this tortuous climb. I felt like it had been hours since I last ate, but my watch showed it had been just six minutes. I tried to make an inventory of the food I had left and form a plan for what order I should eat it. The problem was I didn’t understand the concept of a ‘plan’ at this time – it was baffling. My pace and effort level seemed directly related to the colours of the rocks: in my mind it was imperative I step on the white ones. I knew this to be crazy, but I couldn’t stop the sensations. My headlamp beam only stretched a few metres in front, just enough to illuminate the jumble of steep rocks. ‘Coke, that’s what I need.’ I managed a couple of sips, which momentarily allowed my conscious self to overcome the subconscious. ‘I’ve gotta talk to someone, otherwise I’m gonna fall asleep right here,’ I thought. I let the aura behind catch me up. I said hello and it grunted in bass Italian. Over the next hour of walking, shuffling and stumbling, Luca and I talked. But I never saw his face, and cannot remember the clothes he wore. I was always in front, he always right behind. Part of me wonders whether I invented him to talk to in my moments of need, but a look through the results sheet shows he was real: thank you Luca Messina from Sudtirol. 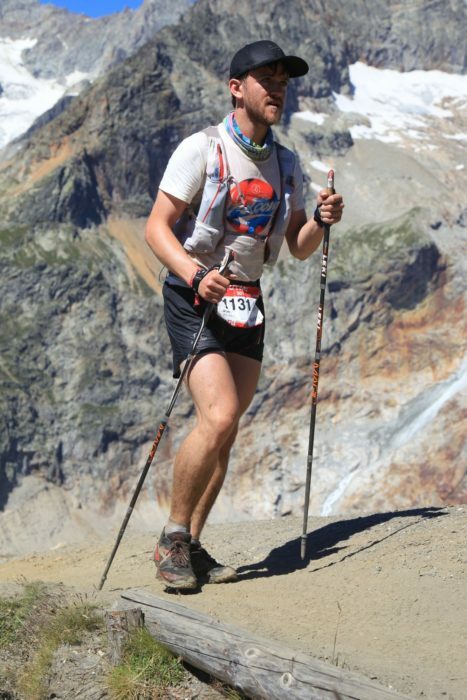 These were the sensations I experienced during the final ascent of Ultra Trail du Mont Blanc (UTMB), after I had been on the go for 32 hours. Only a rocky traverse and 1100m of descent separated me from the finish line of the 170km (105 miles) mountain trail race. Everything I had learned about ultrarunning and looking after myself in the mountains needed to be employed at some stage during this event. I felt acutely aware of how big a step up this race was from my previous longest efforts – it was a whole different ball game. I wouldn’t have said I had a lot of ‘fun’ during the race; it felt too serious to enjoy, too many things that needed to get done, too many tasks to concentrate on. Going into race week, I knew that as a result of multiple illnesses my training had been very poor indeed; I would need to absolutely nail all the details if I was to stand a chance. 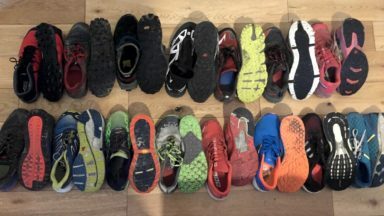 For every training run, I wore the exact shoes, clothing and pack I would on race day; I ate according to my race day nutrition plan, even on easy one hour jogs; I developed an aggressive strategy for dealing with the searing heat of the day; I acclimatised to 3100m in the days leading up to the race; I meticulously calculated calorie, fluid and electrolyte intake. 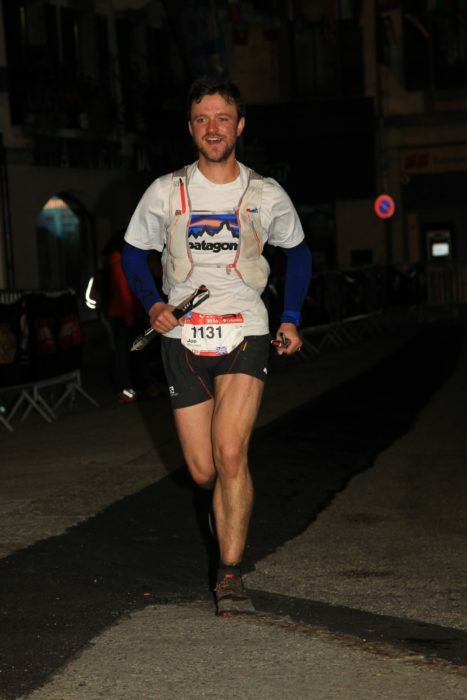 My pacing strategy was to go slowly until Champex (126km/78 miles) then give it everything I had until the finish. The biggest variable I felt I couldn’t anticipate was how long my legs would hold up on me, given the lack of quality training hours I’d had in the preceding months. 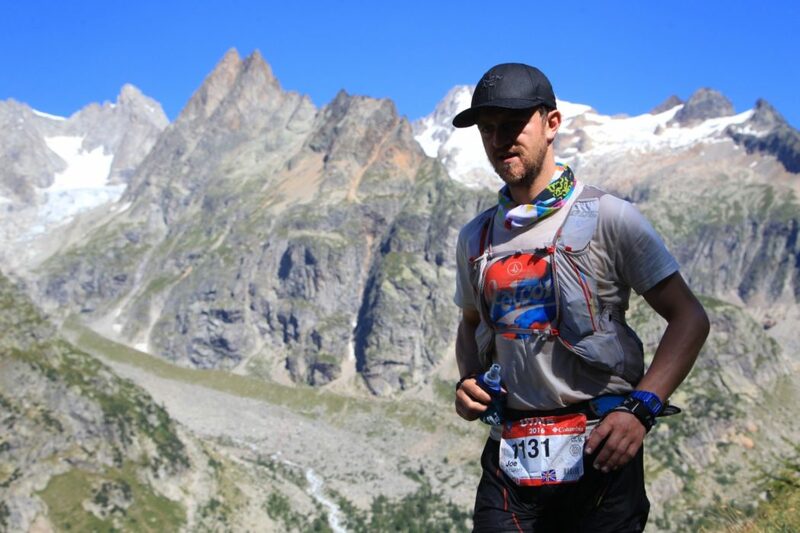 UTMB is not for everyone. For many, it’s too long, too busy, too commercial, too high, too technical, too much ascent, or too much of a spectacle. As for me, I love it. I made sure to keep breathing through my nose so as to down-regulate my effort for the first two-thirds of the race. I crested the first climb nicely back in 979th position, astonished at how hard some of the runners around me were pushing, red-faced and out of breath. The course then descended 1000m in the space of 7.3km – murderously steep, and prime ground for starting the process of quadricep annihilation. As I would do for the next 20 hours, I would take walking breaks on the descents, knowing that I had to take it extremely easy on my unproven legs if I wanted to finish. Runners flew by me, throwing caution to the wind, as we switched our headtorches on for the first night: UTMB has the added challenge of starting at 6pm on a Friday evening. The night passed without incident. I ate one-third of a Clif bar every 20 minutes. I drank around 500ml with 200mg of electrolytes every hour. I ignored all other runners and kept emphatically to my own relaxed pace. 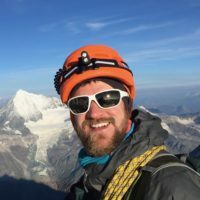 I made my stops at aid stations extremely brief, unscrewing the caps of my bottles before the checkpoints so that I could be in and out in minutes, knowing that if I couldn’t move fast on the trail, I’d have to save time elsewhere. I must have got something wrong though: eight hours in and I had peed just once – it was the colour of treacle. I’d been drinking what I thought was enough, but it was a warm evening – maybe half a litre per hour wasn’t enough. Through the entirety of the rest of the race, I peed only a handful of times. Amazingly, in the final couple of hours (after I stopped using the electrolyte tablets), everything returned to normal: perhaps I’d been overdoing the sodium intake and not drinking enough all along, resulting in hypernatremia with mild dehydration. After nearly 14 hours of running and walking, I neared Courmayeur, 79km (49 miles) in, and a shade under halfway. Despite having taken it very easy to this point, I now began to feel a weight in my legs when running on the flat. Fortunately, I was about to meet my sister, Maddy, who was crewing me for this race. I arrived at the aid station and we immediately set to work on our pre-rehearsed routine. I changed my shoes and socks, cleaned my feet, applied sunscreen and bodyglide, and changed my clothes, while Maddy attended to my pack by refilling water bottles and reloading food for the next section. It worked well and we didn’t need to talk much – less than 10 minutes and I was away. It was here that I made an experimental gamble: I set off into the heat of the day wearing a cotton t-shirt, neckerchief and cotton baseball cap. This appears to go against everything we’ve ever learned about outdoor clothing (‘Never wear cotton!’) My logic was that cotton withholds water and sticks to the skin, thus aiding conductive cooling. I combined this clothing system with two additional 500ml water bottles reserved solely for pouring onto myself, as well as systematically submerging myself in every stream I passed and making an embarrassment of myself at the sponge/water buckets. It worked a charm. As the heat rose to up to 30 degrees on the Grand Col Ferret, I stayed perfectly comfortable, not getting even slightly warm. Runners around me were wilting, but I was fine. The long descent down into Switzerland descends 1500m over 20km, quite gradually for the most part. This is a section of the course that has made and broken many a race in the past and, I have to say, this is where my own efforts began to unravel. Just like I had done previously, I took it easy going down, taking walking breaks and maintaining a very chilled pace, and continually sprayed my quads with water to keep the engine cool. But running now took a bigger effort. Into La Fouly at 110km, I spent a few minutes on the road chatting to elite British fell runner Nicky Spinks – a pleasant diversion from the trail. It was on the gradual descents over the coming kilometres that I felt it: that telltale sign that the quads had had enough. It’s almost a chemical change in the legs, a feeling on every descending step that your muscles are being gently mashed with a meat tenderiser. 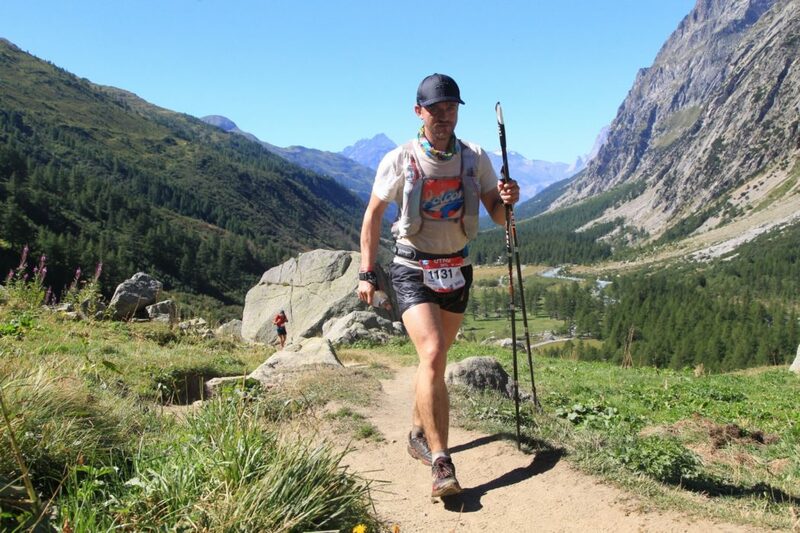 The poles came out for the downhills from here on, and for the rest of the race I adopted a new form of locomotion that involved lurching, staggering, grimacing and the use of poles – a hybrid of running and walking. The legs felt better when kept cold, so I jumped into – like a bath – the picturesque public water troughs in each of the picture-postcard Swiss villages we passed through. What a scene I must have made! After a strong, but rather lengthy climb up to Champex at 124km, I met Maddy again. ‘My legs are cooked,’ I said. This stopover took 25 minutes as we changed shoes, socks and clothing, as well as applying tape to the soles of my battered feet. A cold coke felt rejuvenating. 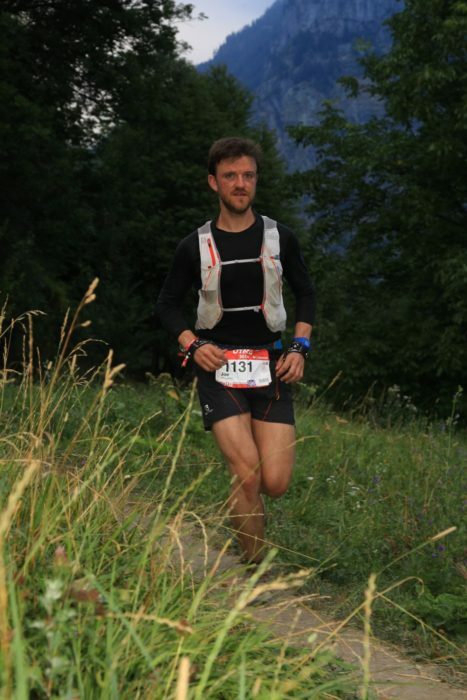 Mentally, and energy-wise, I felt ready for the final 45km with its 2700m of ascent. But my legs were as stiff and sore as they might be the day after running a hard road marathon. Around the shore of the lake, passing the idling tourists, I desperately wanted to run, but the weight in the legs was too much. I admitted to myself that my legs were well and truly done in. This began the final phase of the race, and one that I will surely remember for the rest of my life. Three big climbs and three big descents separated me from the finish. On the first climb, Bovine, I lost my uphill power. I was being caught up easily and couldn’t hang on – was this a lack of mental grit or true muscular weakness? Then began the first wave of the thunderstorm, with the beautiful clear skies of the day making way for a biblical deluge that turned the path into a fast-flowing stream. 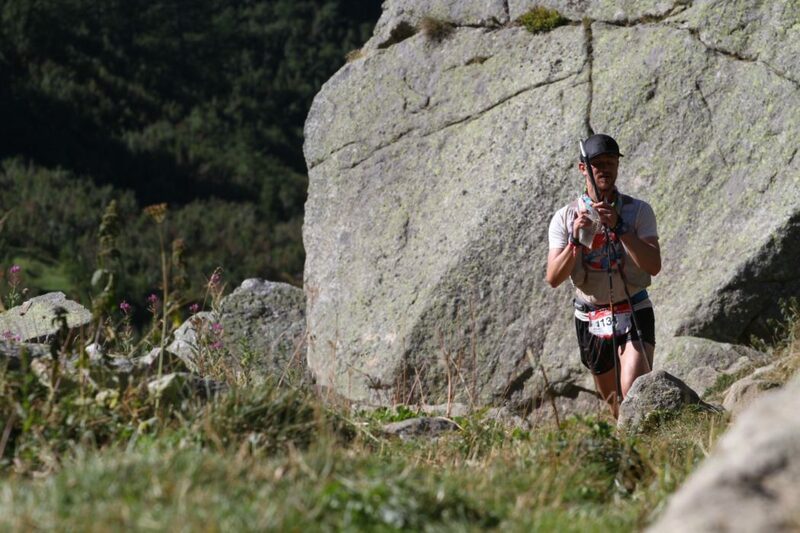 On the descent to Trient, I was caught by Jordi Bes, a man who had previously won the 101km (63 miles) Courmayeur Champex Chamonix (CCC) and placed 3rd in the 119km (74 miles) Sur les Traces des Ducs de Savoie (TDS) – clearly he had been having a bad day. At Trient it got dark and I was pleased to see Maddy. 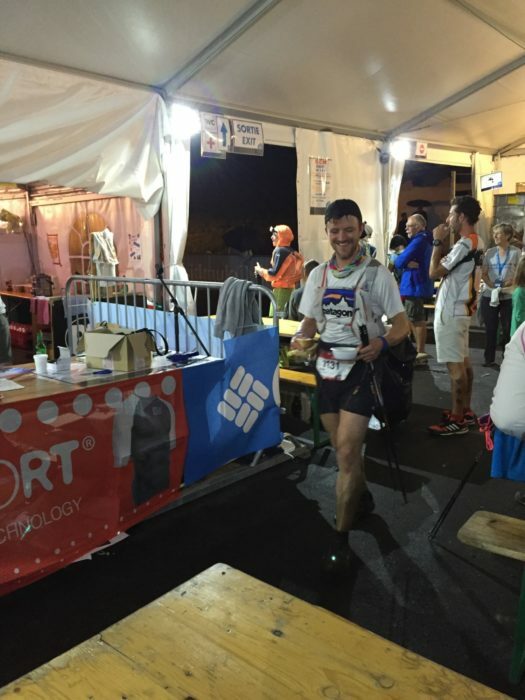 The atmosphere at this aid station was exciting – it seemed a party was going on. During the previous descent, I had stupidly allowed a hotspot to turn into a blister, to turn into a popped blister. The pain soon dissipated, but it was important that Maddy help me tape up again. The penultimate climb is where things began to get weird. We entered the second night, and as the rain began to intensify again, I huddled deeper into my waterproof jacket, hat and buff. 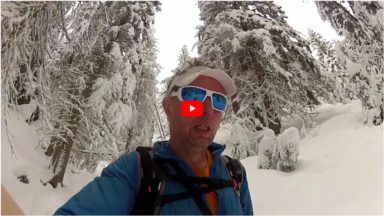 I was aware that – while still walking – there was an important relationship between my headlamp beam, other runners’ headlamp beams, my pace, whether I used poles or not, and the intensity of my effort. I felt that my mind had dropped into a layer beneath the surface, where I didn’t have to directly deal with reality. Except I did have to deal with reality: the storm was about to reach its zenith on the highest and most exposed part of the climb. My 99g waterproof jacket had wet through and I started to get cold. Very cold. But there was no shelter up here, so I managed to run to generate more heat. Thankfully we soon came across a tiny shelter set up by the organisation. Here, I put my waterproof trousers on over my wringing-wet shorts. I was comforted by the fact that I still had plenty more of the mandatory kit that I could have put on, tucked away in my pack. I lurched down the hill, softening my steps by using my poles out in front of me, hands now raw from gripping the handles for almost 30 hours. After descending for what felt like forever, I saw a walker’s signpost that claimed an hour to our next stop, Vallorcine. An hour! I was barely moving faster than a walk anyway – how could this be? At last the lights of the village came into view and I dragged myself into the final big aid station, 19km and one massive climb and descent from the finish. ‘Hey Maddy, I need…um… I need…’ I didn’t know what I needed. My thoughts seemed distorted, jumbled and nonsensical. Words were difficult. ‘Give me your pack, just go and eat anything, then come back and we’ll sort you out,’ said Maddy. It was deeply comforting to leave the decisions to her. I collected some bread, cheese, soup and biscuits, just like I’d done countless times before in this race and returned to the table. ‘Things are getting pretty weird, Maddy.’ She said she knew and said I was going to be ok. I ate my bread, drank my water and shouldered my freshly resupplied pack. I hauled myself off the bench and staggered out of the aid station: five hours to go. The angle of the path was gently uphill, but I couldn’t bring myself to run. 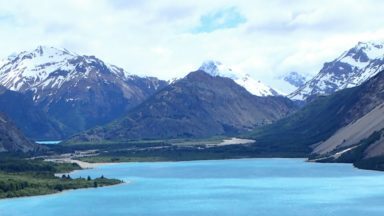 After walking for 20 minutes the chafing between my legs almost got too much to bear; I emptied the contents of my pack out onto the trail, desperately searching for some lubrication – I didn’t find any. For a moment, I considered going all the way back to the aid station for relief, but thought better of it. Maybe a volunteer somewhere will have some, I wished, as I walked as fast as possible up to the start of the notorious final climb: Tete aux Vents. My friend Georgie had come up here to surprise me and cheer me on. 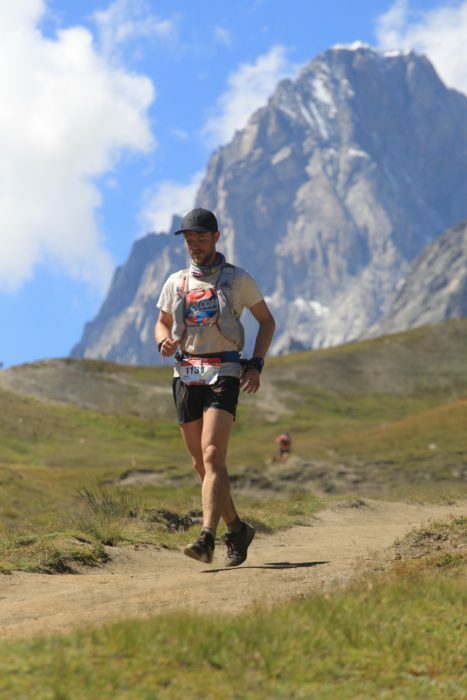 It felt so meaningful to me, so I tried to say something: ‘I’m so tired I can’t remember a time when I wasn’t running UTMB.’ It was true – I had always been making my way around the mountain. I cocked my head back to see the final climb: a sparse trail of headlamps stretching up until they met the stars. Ok, head down, let’s get this done. The path immediately became a desperately steep jumble of boulders and rock steps. After continuing for what felt like hours, it kept on going, the headlamps still miles above. Luckily I had Luca Messina to talk to to stop my brain from completely melting. ‘I’m going to try to run, Luca.’ His aura didn’t follow me as I pathetically shuffled forwards. The terrain was too technical for me to go fast in the darkness of the night and with legs as broken as mine. After a meaningless amount of time I reached the beautiful lights of La Flegere, the last aid station that marks the start of the final descent. I was the only runner in the tent, so the volunteers attended to me personally. An old man with a kind face helped me to some coke and told me it wasn’t too far to go. He must have seen many a tormented athlete such as myself before; his presence was calming as I made my way out of the tent for the final 800m drop to Chamonix. 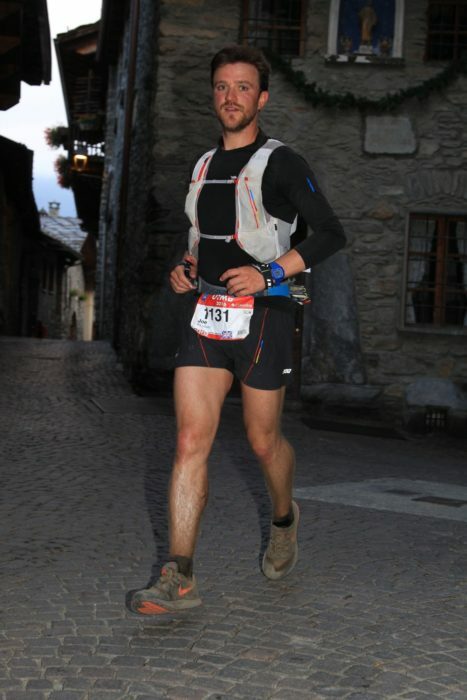 After an hour and twenty minutes of running as fast as I could, I had finally reached the tarmacked streets of Chamonix. I hastened my run and the pain disappeared. I whooped and screamed and tears fell down my face as I made my way through the streets I know so well. It didn’t matter to me that it was 4:45 in the morning and that there was hardly a soul around to cheer for me. Finally I had finished in 34 hours, 43 minutes, placing 193rd in a field of 2500. Forty-two per cent of the starters failed to finish the race. Why was it meaningful to have run this race? I had no real idea why, but it just was. Since finishing, I still don’t have an answer to that question. I feel battered and traumatised and broken, but completely calm. I can explain what happened, but I can’t tell you what it was like. I wonder what will happen next year..
Tour of Mont Blanc - Clockwise or Anti-Clockwise?